Arm Candy For You: Get Organised you Lazy b**!! Get Organised you Lazy b**!! That's what I tell myself daily whenever I walk into the mess my craft room is! OK...............I have piles of leather in a cardboard box under the table where I keep my sewing machine.I have tons of zippers in some bags,the hooks & buckles for my bags in assorted plastic bags! my interfacing are in TV cabinet storage...............the fabrics are ALL over my house,the scissors,measuring tapes,tailors chalk strewn EVERYWHERE! So you get the drift.................I have to literally wade through stuff to find what I need while sewing! And FINALLY I have realized it is hampering my productivity(my hubby is sighing with relief)..................so I am going to get organized! And as technology slaves,the first thing we will do is obviously google! How neat are the buttons just hanging down from the shelf...............now only thing I need to figure out is HOW in the God's name are they hanging??? ?.............is it magnetic? ?......doesn't look like,any ideas? 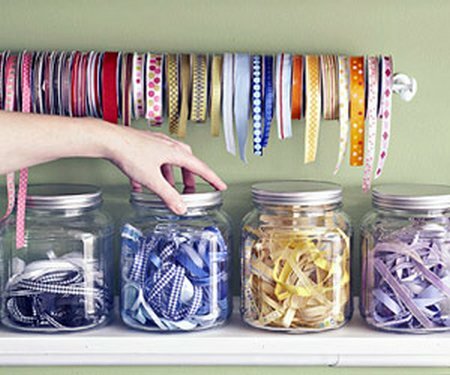 This is one of the easiest wayz to get organised,the jars are cheap,easily available & handy! I liked this idea too quite a bit...............though I don't see this working for me as I have way too many supplies but I love the decluttered look! How handy is this???? ?................and I am sure I can make this,my brain is already churning out the technique to make this..............I may make this in canvas so it's sturdy & longer lasting & if the layers get too bulky at the seams there are alwayz rivets! One of the best ideas I saw is this one & what is the best part???? ?..................this comes as a DIY! You can find the instructions to make this Inspirational Organizer here. What does your work space/crafting zone look like? OMG the organization would be wonderful. Like you I have "stuff" all over the house. Canvas, paints, mosaic tiles and tools of all kinds. Thanks for sharing, could you come over to my house when you're finished with yours? My boyfriend and I both work from home in our tiny one bedroom apartment. 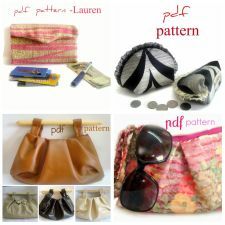 I have to be hyper organized to create items by my line of handmade bags, Victory Bags. Here are some of the things I have found that really work. The most cost effective way I have found for storing and organizing fabric is cardboard bankers boxes. They are rated by how much weight they can hold, and can neatly be stacked. I like them because they keep light and dust off the fabric. Just make sure you label them in pencil so you can change what they say. For smaller notions I like to use clear plastic storage, sandwich bags. These can be thrown into larger containers and organized by content type. For example, all 7 inch zippers in a bag, and all the bags of zippers in a larger bag or box. Something really wonderful I have found for organizing lots of smaller notions is over the door shoe organizers with clear pockets. You can make one, and hang it the wall of your sewing room. I have square black sewing tote similar to the pink one. I love it! I keep it next to me when I working, and things are always in reach. I keep clear plastic pencil cases in the center with smaller items inside that are organized by type. I have one box for needles, one for thread, one for serger notions, and so on. It's great being able to find everything. pocket and there they are. You can see some of my bags at http://www.facebook.com/VictoryBags. I found your blog thru tt&j and now follow so thanks for all these ideas! 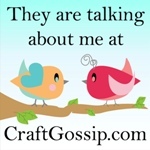 I am trying to figure out how to organize my crafts too...and I have no idea where to start! THose little baby food jar lids are nailed into the board and them you just unscrew the lid to use the stored items. That is a very old oraganization method. We had them for my dad's screws and such in his workshop. Not very many baby foods come in glass jars these days though! Just found your blog today! THanks for the inspiration! Gravy jars are a bit taller but work well for the under the shelf jars, they have metal lids. Love your ideas, thank you.